“Baby it’s cold outside, baby it’s cold outside”. This time of year we sit inside and watch the world go by. Around my house we’re usually watching football, “Flip this House”, or my favorite, “Little People, Big World”. When the weather turns cold outside many people forget, or are unaware, that January and February are the best months to apply organics to their yard. I know you might wonder, “What does the ‘Sultan of Sod’ mean by organics?”. The simple answer is: compost, or humus. To apply organics this time of year to any kind of lawn, from dormant Bermuda to Fescue or Ryegrass, the method is the same. Spread the compost or humus evenly over the entire lawn about 1/8th of an inch thick. Be sure to water the compost in once it is laid. 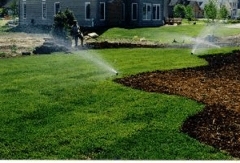 All lawns take nutrients from the soil. If the nutrients aren’t replaced, the lawn will eventually starve. By applying organics at this time of year, more of it is absorbed into the soil rather than evaporated into the air. If you happened to let your lawn go dormant, this application of organics will be beneficial for months to come. So get off the couch and get into the back yard now. When it’s hot, then you can go back inside knowing you have done well by your lawn. Do not wait!!! Do it now!! !